When you release as much quality music as NGHTMRE has so far in 2016, the big guys are bound to take notice. Moombahton mastermind Dillon Francis is easily the biggest name on his growing list of collaborators, and to sweeten the deal, he even took it upon himself to show off their new track during his latest performance. In a video taken last night at Euphoria Music Festival in Austin with surprisingly crisp sound quality, you can hear hints of a galloping moombahton drum pattern. Where the as-yet-unnamed ID really shines is its bass drop, though; it’s difficult to think of another production out there that sounds anything like it. What’s more, music fans don’t have to keep guessing when the track will officially come out. Last week, Francis was considerate enough to Tweet that it would be released at the end of April. 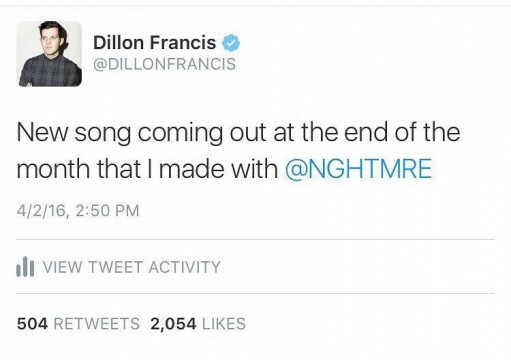 Now that NGHTMRE’s got a Dillon Francis collab under his belt, the 2016 festival season looks promising indeed for the rising talent. Make sure to keep an eye on him in the months to follow.